Below are instructions in how to measure your windows to get a quote on new or replacement shutters. If you would like, you can download a print ready version here. Measure the width of the opening and divide by 2. Measure the height of the opening. 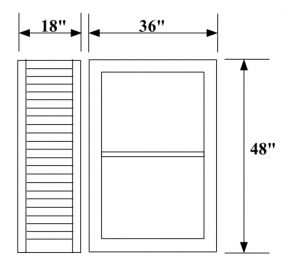 The size of each shutter is ½ the width and the actual height of the opening = 18” wide x 48” high. Exact measurements are not necessary for this application. 1. Measure the width of the opening in 3 places as shown. (Use the smallest of these measurements). 2. Measure the height of the opening at the left side of the opening, the center of the opening, and the right side of the opening (and use the smallest of these measurements). 3. For Pintle and Hinge Hardware deduct ½” in width for side clearance, and deduct 1/8” in width for a space between the shutter when they are in the closed position. (See formula below). 4. 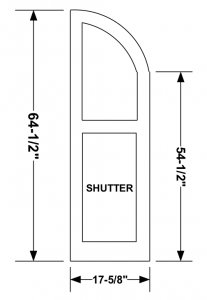 The shutter height is the opening measurement less ½”. ***IMPORTANT NOTE***: Knowing how you desire to have the shutters fit into the pocket determines what width and length you are going to measure. 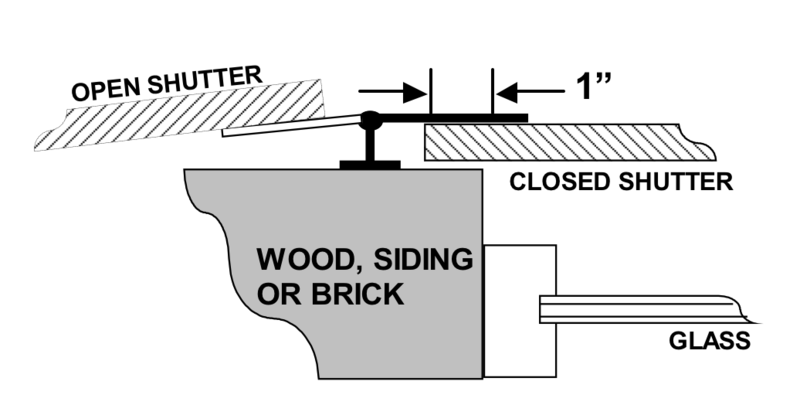 Shown below are two different options that relate to a Pocket Recessed Shutter Application, where both options are installed on the same structure. Note that the opening being measured in OPTION TYPE “A” is different than the opening being measured in option type “B”. The shutters in Type “B” will be considerably larger than the shutters in Type “A”. Measure the height on the high side of the opening as shown in Drawing C.
Measure the height on the low side of the opening as shown in Drawing C.
Measure the width at the top or bottom of the LOW SIDE as shown in Drawing D.
Divide the width by 2. 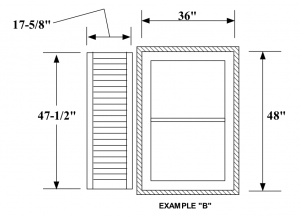 Exact measurements are not necessary for this application because the shutters will be secured to the side of the structure with decking or stainless steel screws. Shutters Closing Into a Pocket. 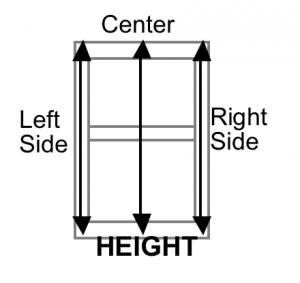 Measure the height as shown in drawing C. (Use smallest measurements). 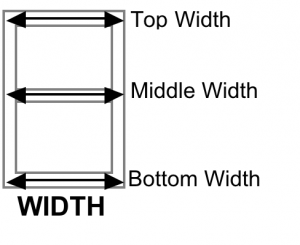 Measure the width as shown in drawing D. (Use smallest measurement). 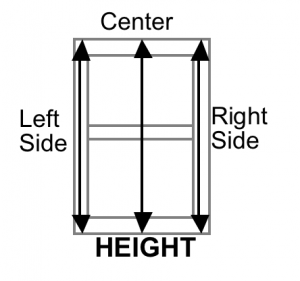 For height, deduct ½” from the “high side height”, and ½” from the “low side height”. 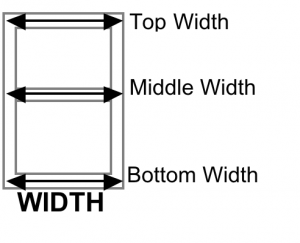 For width, deduct 5/8” from the smallest measurement and divide by 2. 1. Measure the width of the opening at the top of the middle of the opening, and the bottom of the opening to be covered and use the largest of these measurements). 2. Measure the height of the opening at the left side of the opening, the center of the opening, and the right side of the opening (and use the largest of these measurements). 3. For Pintle & Hinge Hardware add 2” in width for side clearance, and allow 1/8” in width for a space between the shutters when they are in the closed position. 4. The shutter height is the opening measurement +2” if there is no sill. (Flush Mount B). If there is a sill protruding out from the wall, add 1” to the size, because the shutter will have to fit above the sill by 1/4”. Shown below are two different options that can pertain to a Flush Shutter Application. Note that both options are applied to the same type of structure. Knowing how you desire to have the shutters fit over the opening determines what width and length you are going to measure. Note that the opening being measured in OPTION TYPE “A” is different in than the opening being measured in option type “B”. The shutters in Type “B” will be considerably larger than the shutters in Type “A”.